Hardback ISBN 0 313 28693 0. As will be clear from the heading, this book has been out for more than seven years. I had always intended to review it and the very recent appearance of John Dressler�s �Alan Rawsthorne Bio-Bibliography� gave me the opportunity to consider it. It forms an extremely useful supplement to Stephen Banfield�s highly detailed if congested Finzi biography (Faber), now in paperback. It is a complement to that book and indeed to the biography �that is to come�; the one that everyone has awaited for years - the study by Diana McVeagh. These Greenwood Press Bio-Bibliographies follow a certain formula.. They are more in the nature of resource books than providing intrinsically engaging reading in their own right. This one has its preoccupation with lists of this and that leavened by two biographical narratives covering 22 of the 200 pages. The first is by his friend and collaborator, the composer, editor and pianist Howard Ferguson. The second is by John Dressler himself who, in personable and attractive style, touches in the details around the Ferguson narrative while producing an essay that is readable in its own right. The Dressler study is further filled out by fifteen smaller personal tributes and profiles. These are from singers (Stephen Varcoe, Ian Partridge), instrumentalists (John Denman, Yo-Yo Ma, Alan Hacker), fellow composers (Robin Milford and John Scott) and conductors (Stephen Cleobury and Paul Spicer). The book is laid out in three further Parts and seven Appendices. These form the meat of what is on offer. Finzi�s output was not large. It is covered in 44 pages organised by genre (e.g. Solo Songs; Works for voice and orchestra, Arrangements and Editions). Each entry lists full title details, cross-references to other parts of the book as well as details of premieres and other significant performances (a few fascinating surprises here). The Discography rattles through the growing ranks of CDs and previously cassettes and LPs and 78s. Also listed are private archive recordings. I had understood that the original broadcast of the Cello Concerto (Christopher Bunting, 1956) had been recorded but it is not listed here. This part of the book has dated most with the vigorous recording scene adding new recordings and reissues of older CDs and LPs. 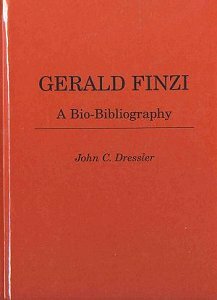 The Bibliography lists the usual press cutting details, articles and the writings by Finzi as well as correspondence held by the BBC Data Centre at Caversham Park, Reading. The Appendices cover: the make up of cycles and sets, an alphabetical list of works, a chronological list, a list by opus number, a list of song sketches, a list of Hardy song sketches and the Oxford manuscript collection. Finally there is an invaluably detailed index. Typography and printing is excellent with high definition in the print and a sober but attractive orange-brick coloured vinyl bind. Finzians who may have joined the �select� since 1997 should be reminded of this book and should order it now. It remains uniquely valuable.